Jenny Jen42: a taste test I can believe in! a taste test I can believe in! after a VERY successful time at Crafty bastards, feeling a bit wiped out and little overwhelmed by what I have to do and make before November...i needed a little distraction....off with my internet mind and vola! 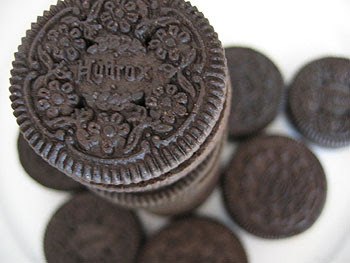 i stumbled a pond not martha blog to see these great pictures of Oreo's and hydrox! i remembered this taste test as a kid. i liked the fancy decor of the hydrox as well as the different taste which i guess was not quite as sweet as the Oreo.Now, i am a huge Oreo fan...since being a little one...growing up in the 60's with parents from the 50's meant i got to eat cookies and sugar coated cereal growing up...tony and tiger and I were best buds! so I'm not knocking the Oreo here....and I'm not too sure when I got to try my first hydrox..they disappeared in my adult life, and now they are back! ...i really loved this taste test. 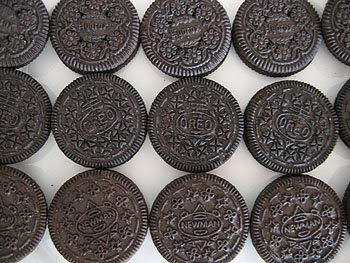 makes me want to go out get my some subjects of my own to do my own sandwich cookie taste test! check out the entire review here as well as the entire not martha blog.